If you are looking to create a very modern, one-of-a-kind interior in your living room, there can be dozens of possible ways to do so. Equipping your room with an interactive LED coffee table is just one of them. Of course, this model might seem too unusual for the majority of the homeowners – it is bright, it is eye-catching, and it is definitely interior demanding. However, if you take some time to think about it, you will see that certain interiors will only benefit from a coffee table like that. The first thing that comes to mind is a hi-tech interior. Obviously, a room that is designed in a highly modern – maybe even a bit futuristic – fashion will benefit from such a bright and stylish addition. The main focus of your room is relatively not important under these circumstances – you will have a chance to experiment with that, shifting your focus of attention from one furniture piece to another. 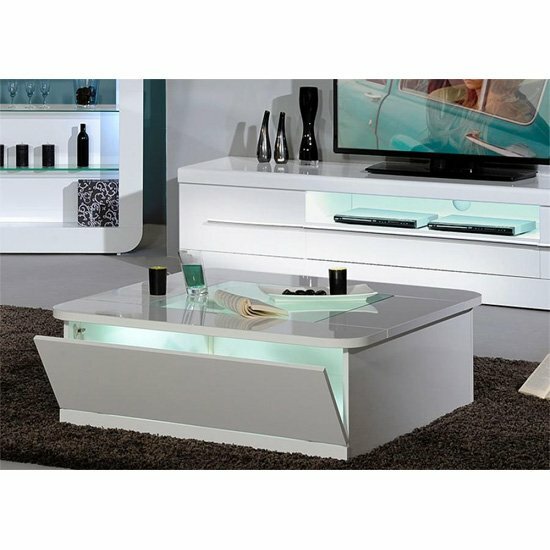 Mixed interior can also benefit from an interactive LED coffee table; yet, you will have to be very careful while thinking over your future furniture arrangement. On the whole, including one bright table into your mixed style living room can be a great idea – provided there are no other objects that would draw too much attention. One highly contemporary piece per room is more than enough in a mixed interior living room. Plenty of interactive coffee tables are designed in high gloss, which is why they will be perfect for living rooms that have matching glossy furniture. These matching items do not necessarily have to have LEDs of their own – but if they do, this is even better. Though, of course, do not forget that you have to stay reasonable while working on this kind of interior – otherwise, your living room will look like a Christmas tree. Another possible decoration pattern presupposes the combination of LEDs and glass. A coffee table does not necessarily have to feature a glass surface (even though it is highly probable), but other items in your room should better have glass inserts. Together with LEDs, they will create a nice and modern atmosphere in your living room. If your living features metal decorative elements, an interactive LED coffee table will easily become a part of your environment. Both metal and LEDs are highly popular in modern interiors, and they look great together. Of course, there is one final consideration before buying an interactive LED coffee table – and that is the size of your room. Even the most compact table model may be out of place in a small living room – mostly because of its bright, unusual design. Yet, if your living room is spacious and features other contemporary decoration elements, you can feel free to shop for an interactive LED coffee table. Normally, the most impressive furniture selection can be found in big stores with established reputation, so you should probably start from there.